Transmission pipeline failures present risks that may impact people, property, the environment, and economies beyond the edges of pipeline rights-of-way. Locate transmission pipelines in your area and obtain pipeline operator contact information using the National Pipeline Mapping System (NPMS). Local, state, and Federal government officials may import the pipeline mapping information into their GIS or mapping systems. Understand pipeline risks. Read Building Safe Communities: Pipeline Risk and its Application to Local Development Decisions. Manage development near transmission pipelines. 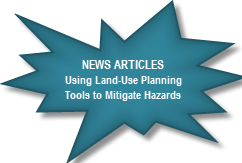 See the recommended land use practices for local governments from the PIPA Report, Partnering to Further Enhance Pipeline Safety In Communities Through Risk-Informed Land Use Planning, below. Review recorded webinar presentations conducted for land planners and other stakeholders in various states. 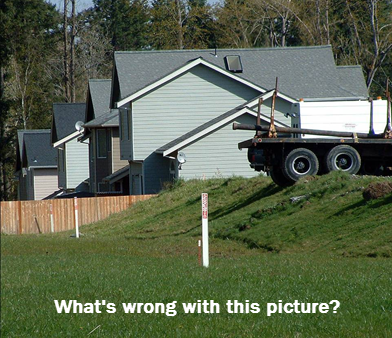 This picture depicts an example of a development adjacent to a transmission pipeline right-of-way that was constructed without consultation among property developer/owner, transmission pipeline operator and local government. Note the encroachment of the fence on the transmission pipeline right-of-way. Property owners are prohibited from installing large landscaping, patios or other structures on transmission pipeline rights-of-way. The fence obstructs the pipeline operator’s ability to inspect and maintain the pipeline and could impede emergency access. With proper, advance consultation and planning between the stakeholders in the initial platting stage, these types of encroachments could have been prevented. Also note that the truck on the right in this picture presents the potential for heavy vehicular encroachment over the pipeline. This could damage the pipeline and any such encroachment should be coordinated with the pipeline operator. Summary Report for Elected and Appointed County Officials. Prepared by the National Association of Counties (NACo) to help build county official’s awareness and capacity to improve transmission pipeline safety. Evaluation Worksheet for Local Governments. This can be used to perform gap analyses comparing the community’s current related practices to the PIPA recommended practices. Local government agencies responsible for land use and development planning or the issuance of development permits should obtain mapping data for all transmission pipelines within their areas of jurisdiction from PHMSA's National Pipeline Mapping System or from the transmission pipeline operators and show these pipelines on maps used for development planning. Local governments should define a "consultation zone" to provide a mechanism for communication between property developers/owners and operators of nearby transmission pipelines when new land uses and property developments are being planned. 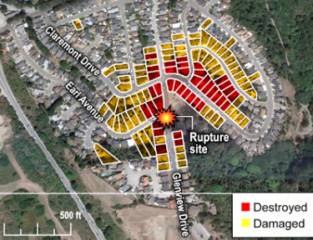 Local governments should consider implementing "planning areas" to enhance safety when new land use and property development is planned near transmission pipelines. Local governments should consider allowing site planning flexibility in the development of commercial, industrial or residential property whenever a transmission pipeline is located in, or in close proximity to, the proposed development.